Two-time defending champion John Isner won the battle of the tallest players on the ATP tour, defeating Ivo Karlovic of Croatia 7-6 (3), 7-6 (3) on Friday to advance to the semi finals of the Hall of Fame Tennis Championships. Isner won his 13th straight match on Newport's grass courts and raised his mark to 13-0 in tiebreakers during the streak. 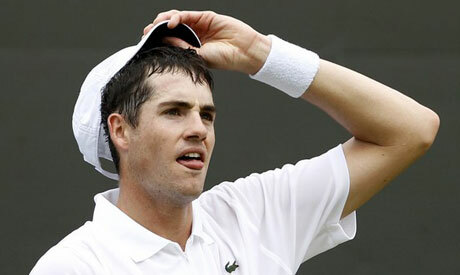 The second-seeded Isner, listed at 6-foot-9, served 23 aces, including three in each of the tiebreaks. The 6-foot-10 Karlovic had 14 aces, but double faulted on the match's final point. The 1 hour, 37 minute match, played in humid conditions with peeks of sunshine, had few extended points. Karlovic played his first ATP tournament since being sidelined with spinal meningitis from late April to early May.